In the market for Apple's leather case that can officially wrap your iPhone X in style but thrown off by the $50 price? Fret not, as you can now have one at about 40% off over on Amazon... as long as you like taupe color. That particular version of the case sees a price cut down to $30 from the official $49 tag that Apple itself is still selling it at, and you can save an extra dollar and change by clipping a virtual coupon. That's the lowest total price we've seen the official Apple leather case for the iPhone X at, and rivals some third-party offerings from lesser-known brands at this point. Simple, elegant, and designed by Apple itself, the iPhone X case is made out of "specially tanned and finished European leather," (we've no idea why premium leather cases always tout exotic EU leather instead of the good ol' US cowhide) and will fit your new handset perfectly. On the inside, the case features a microfiber lining for increased protection. 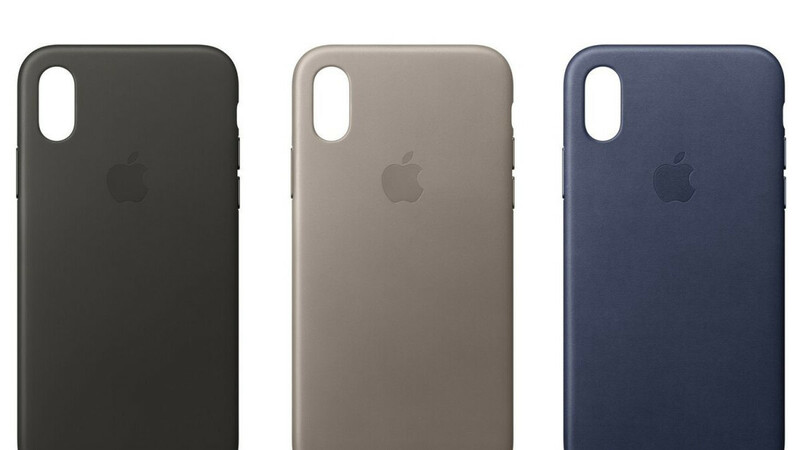 It is compatible with wireless charging - meaning you don't have to take it off when wirelessly charging your iPhone X. Apples is selling the case in no less than nine color variants to appeal to all tastes, and taupe it is for the cheapskates among us. Is this an article or an advertorial? PhoneArena. That should explain everything. But putting that aside. There is third party leather cases for even less than this sale price of $30. Sure it won't have the Apple logo, but it's still a leather case none the less. Leather, or fake leather? I'l take the real bison leather. Of course you would recommend a knock off product. You use a knock off phone. Phonearena routinely post articles about phone and accessory sales. When it’s an Apple product, it’s an ‘advertorial’ tho, right? Nope, but when I see a s**tload of advertorials dressed as articles on one day, I say something about it. This time it happens to be an Apple ad. Doesnt ship to Canada :( For those looking into these cases, I know its expensive but its honestly the best case you can buy for the X. Those are actually really nice too. Rebel, here’s what I know. I got an iPhone X recently and got that Apple case (red) as a gift from friend. When I walked into Apple store to asks a few “how-to” questions (haven’t used iPhone since 5s) they brought me a new case to replace mine because it was damaged (little crack on the bottom corner - they didn’t even ask - just brought a new one and offered it for free as a replacement while I wait. This is what I like about Apple. It’s more than a product. (Coming from a long time Samsung user). Most stores do this, I know Noreve does this too. Although you have to send it since they don't have physical stores. And there are plenty of cases Apple has to replace it for free and they don't. Should change your name to RebelwithoutaBrain. #deflection, putting on the blinders because the truth hurts that Apple has some of the best customer support in the world. Lol I get a notification and I click on hit, unsurprisingly seeing you reply with another (probably whining) comment. I didn't even bother to read it. Good job, ya played yourself. It’s not 60% off, only 38..
Love the leather cases. Plan to get one for x plus. Probably have to pay full price. Ugh. Apples leather case happens to be the best case I’ve used, except the leather starts to feel a little tacky after a month or two. The saddle brown color rocks.